Combining the performance and convenience of dry cells with the cost-efficiency of rechargeable batteries, eneloop is the best choice for you and the environment. Now is the time to change to clean eneloop energy.Recharge up to 500 times and save real money. Although they might cost a little more than conventional dry cells, that initial premium pays off with big savings in the long run-eneloop batteries can be reused up to 500 times. Ready to use after five years in storage. Low self-discharge capability means you can use our pre-charged eneloop batteries immediately after purchase, just like a conventional battery. Even after five years in the closet, eneloop batteries are good to go-something other rechargeable batteries just can’ t complete with. 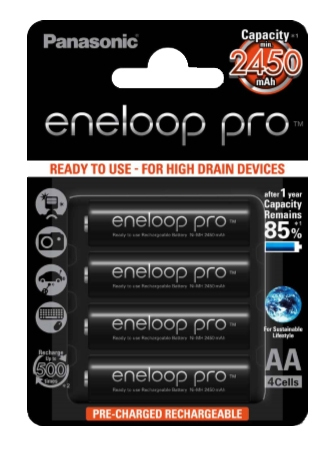 This makes eneloop ideal for everyday appliances such as clocks, toys, and remote controllers, as well as the torches and radios you tend to forget until an emergency. In more than 60 countries around the world, eneloop batteries are changing a culture of waste into one that values efficiency and reusability. With eneloop, you have the power to make the world a cleaner place without sacrificing performance, convenience, or value for money. The relationship between convenience and ecology is a difficult one. People like to choose products that offer an easy, instant solution even though the cost to our planet-and all who live on it-is high. On the other hand, almost everybody would switch to a cleaner technology if it guarantees superior performance and value without giving up convenience and cost-efficiency. Panasonic is actively creating products that benefit consumers and the environment. In fact, global ecology is central to every aspect of our business. In the field of consumer energy, we searched for ways to minimize wastage, developing the technology to make batteries last longer-much, much longer. The answer is eneloop. This battery not only outperforms disposable products in terms of reliability, efficiency, and value, it can also be reused up to 500 times. That’ s a lot of batteries saved from the trash. By making the change to eneloop, you are joining millions of other users who want to live in a cleaner world. And so the real idea behind eneloop is hope-and a belief that it’ s never too late to make a positive change.